Don Sabean worked for many years as a labourer, berry picker and general jack-of-all trades. 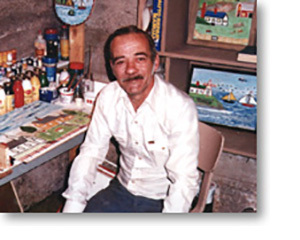 He started painting in order to decorate his home, and was "discovered" when Stephen Outhouse, a well known Nova Scotian carver, visited him and saw his work. It was some time, however, before Stephen could convince Don that his work was worthy of public distribution. 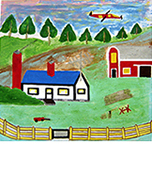 In 1993, two years after his work was first made available publicly, a painting by Don was selected for the Nova Scotia Folk Art Festival poster. Sadly, Don died of heart failure and diabetes only two weeks before the opening of the festival. 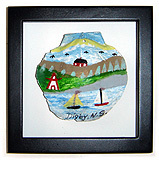 Ref: Nova Scotia Folk Art Festival Society, A Joyous Vision - Contemporary Folk Art in Nova Scotia (1995); McKendry, An Illustrated Companion to Canadian Folk Art (1999).